This is an interesting map of the political campaign contributions from companies in the oil & gas industries to politicians who are candidates for the US federal office. This is a relationship map of the contribution network and therefore, the icons for the companies and candidates are placed so that they are as close as possible to whomever they contribute to or receive contributions from. 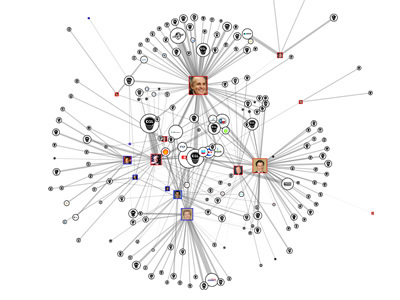 The tool allows users to not only see the oil contribution network for the 2008 US Presidential Race, but also from 2000 and 2004, where George W. Bush's dense network of nodes is impressive. For more information on how the graphs are generated there's a FAQ page with further details. I do get the feeling that the bush graphic would look less one-sided if some of the ones that are "orbiting" him were placed half-way between him and the other candidates that they are funding... very good idea for visual display though, the 2008 one could hold my attention for a while! Who is the artist that created hand drawn graphs of oil companies? He committed suicide, I think. I would imagine you're referring to Mark Lombardi. How about a map of the contributions of teachers' unions and labor unions? 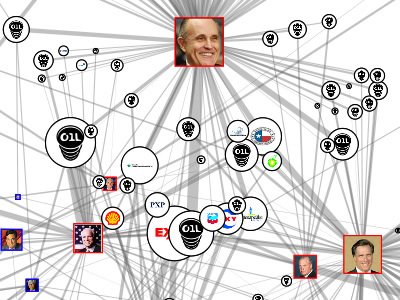 And how about a map of contributions by the lawyers' lobby?